Did Supernatural just have one of its best episodes ever? Supernatural Season 11 Episode 4 put a clever twist on the monster of the week focus by making the point of view come from the Impala. And with some major bro moments, some solid humor and the return of young John Winchester, this was an exciting hour to talk about. So join in the latest Supernatural Round Table and discuss “Baby” with TV Fanatic staff writers Sean McKenna and Christine Laskodi and The Winchester Family Business’ Alice Jester and Nightsky! And see the episode again when you watch Supernatural online! Christine: For me, it was easily that “Night Moves” scene, just watching the brothers having a great time together singing classic rock. I had a huge smile on my face during that entire sequence. Alice: No contest, this is easily one of my favorite scenes in the entire series. Whenever you want to simultaneously show pride but at the same time give your brother a hard time for screwing a waitress in the back of your car, breaking out the Seger tunes will do it. Sam’s reaction was priceless. “Don’t ‘Night Moves’ me.” But when he played along with the “in the back seat of my brother’s 67 Chevy” line and then the two were singing together, I went into fan girl bliss. Then I sang along, too. Nightsky: The long talk the boys had in the car. I’m so tired of them talking for 30 seconds in nothing more than broken sentences and incomplete thoughts! This was a heart-to-heart talk with Sam confiding in Dean about the infection, the prayer and the visions. They both trusted each other enough to confess their most personal dreams. I especially liked that even though Dean initially dismissed Sam’s theory that God was talking to him, Sam persisted, bringing up his concerns a second time. Hallelujah! Sean: This was a fantastic episode with so many great scenes. But I have to agree with Nightsky about that heart-to-heart chat in the car. This wasn’t some short little ordeal, and it wasn’t even the last scene in the hour. This felt like a real conversation where both Sam and Dean participated. It felt honest and natural. This was a standout moment for sure. What did you think of having the episode's point of view be from the Impala? Christine: It was such a clever and beautiful idea. For the entirety of the series, Baby has been a series regular in the same way that Jared Padalecki and Jensen Ackles have been, so it was incredible to see a case through her eyes. She takes a lot of damage, poor girl. The direction was amazing. The writing was amazing. "Baby" is automatically lumped in with the fan-favorite episodes for me. I'm so pleasantly surprised that after over a decade on television, the writing staff at Supernatural can still find ways to surprise us with new storytelling angles. It gives me hope for the future of the series. Alice: It was brilliant. It was like we were sitting in the back of the car with Sam and Dean the whole time, a personal invitation to their world. I loved that perspective, and it really drew you into the story. Plus it pushed the way scenes were shot into new and unique territory. Director Thomas J. Wright did something masterful and wildly creative. Suddenly a monster of the week hunt turned into something you’ve never witnessed before. Considering this is Supernatural Season 11, that says a ton. Nightsky: It was original and creative without being silly like Kit in Night Rider. 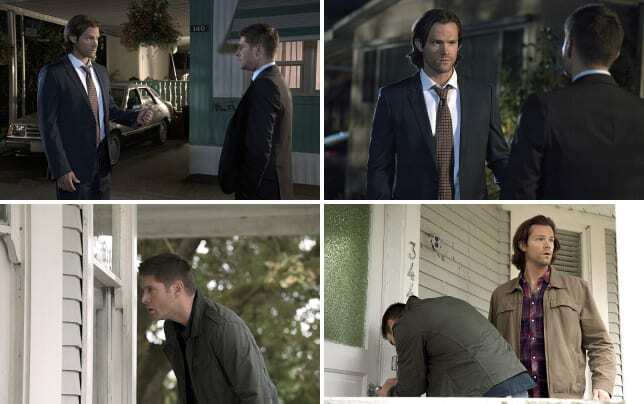 It was risky but Serge Ladouceur, director Wright, and Jared and Jensen made it work brilliantly. I enjoyed it even more after hearing Jensen tell us how much he loved driving down the road with Jared, the Impala and no crew beside them. Sean: I first heard the idea and thought it was going to be real cheesy or something. I love that Supernatural tries different things, but this one sided like a stretch. And yet it worked out wonderfully. We really got to ride along with Sam and Dean. Plus, we got those moments where we see the brothers on the road or just hanging out, all the stuff in between the hunt. This was an idea that had some great payoff. Is God sending visions to Sam or is it someone else? Christine: It's Chuck. Chuck is sending Sam the visions! Haha! I hope it is God. He's been this removed figure that moves all of the pieces for so long. At some point, it's time for God to step in and work with the Winchesters directly, and not through angels. What better time than now, with a villain as huge as they're building the Darkness out to be? Though, I could see it turning in a different direction, and the visions coming from the Darkness in an elaborate plan. Was anyone else really bummed when Sam said, "Dad?" and it WASN'T Jeffrey Dean Morgan? Alice: All money is on Lucifer. After all, he’s contacted Sam through dreams before. However, part of me wonders if Michael has a role in this too, if anything just to add a twist to the whole thing. But the least likely of the three is God. Nightsky: This is the second or third clue we’ve been given that it is Lucifer (“I was never able to fool you”). These clues are almost so obvious that I’m beginning to wonder if they are a misdirect. I still don’t think it is God, though, because where would the show go after God himself took the side of the Winchesters? Sean: My gut says Lucifer, but I’m wondering if Supernatural is going to go another direction entirely. I feel with all the times that God has continued to be mentioned, he as a character has to appear on the show at some point, right? Or would that be final season material. Hmmm, I’m really intrigued by the visions and what they could mean though. Should Dean have told Sam about his Darkness connection after Sam talked about being infected? Christine: Of course he should have! That was the perfect moment. The BM moment! I really don't fully understand why Dean is playing his Darkness connection so close to his chest at this point. Is he afraid to tell Sam? For as much positive change that is happening between the brothers, that one large elephant is still standing in the middle of the room, or car in this case. Dean didn't even seem to consider sharing that with Sam in that moment. Though, I'm wondering if there's any meaning to Dean dreaming of John, and Sam dreaming of Mary. Alice: I think he did, at least in his own twisted way. He told Sam that he didn’t believe in visions or that anyone was there to help them. He called them dreams that didn’t mean anything. So I think he’s dismissing what he saw and refusing to believe it meant something. He was being honest with Sam. However, I don’t think he’s seen his last vision (ditto for Sam) so when it does happen again he better get out of that river of denial and start talking! Nightsky: Sam offers his thoughts more quickly and easily than Dean. It takes a lot for Dean to admit his greatest fears, and Dean is very scared by that “connection.” I believe he is in denial that he could still be part of the problem because it scares him so much. That is why he worked so hard to convince Sam that his visions meant nothing. If Dean accepts that Sam’s visions are real, then he might have to face that his visions are real, too. Sean: I really like that thought that Dean doesn’t want to admit that Sam’s visions might be real because then so might his. And as much as it was the perfect opportunity to talk about it, that’s just what makes Dean different than Sam. But the conversation overall felt honest between the brothers and I loved how it segued into their more “regular” dreams involving their parents. Will we (should we) see more of Sam and Dean having some fun while on the road? Christine: I hope so. It was such a breath of fresh air to watch them having fun again. It reminded me of a Supernatural Season 1 episode. Classic rock, monster of the week and Dean checking out girls. I don't even realize how much I miss these moments until I have them again and find myself considering how the show has evolved. Throughout that evolution, the Winchester's close brotherly friendship is the one thing that the writers seems to have backed off of, and I hope they start to organically incorporate it again. Alice: Oh please, please, please, please! Everything that “Baby” gave us was exactly what’s been missing from this show. The humor, the light-hearted moments, the brothers just kicking back and passing the time enjoying each other’s company. I never understood how that all managed to go away. They should do a “Baby”-like episode every season. Looking at the Winchesters through her world is so much better. Nightsky: So far, Supernatural Season 11 is hitting all the right notes. In my book, we’re 4 for 4 this year with an excellent mix of monsters, brotherly love and myth arc. 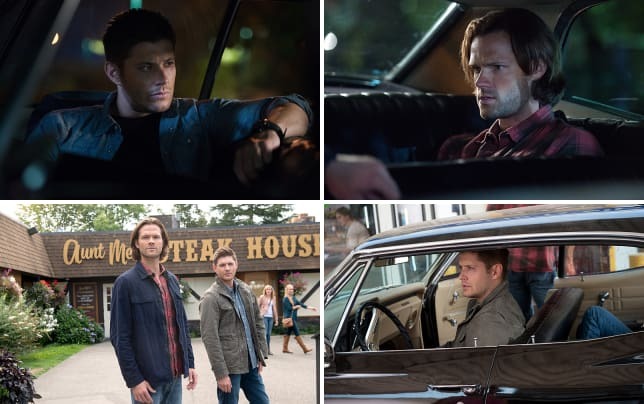 With this new found (or rediscovered) understanding of the recipe for classic Supernatural, yes, I think we will see more teasing and fun between the brothers! Sean: I hope so, too. I love the big mythology stuff and the larger story, but it’s far less entertaining when Sam and Dean aren’t having a little fun in between. Some more classic rock, some more humor, some more regular brother stuff would be fantastic. Mixing it all together works wonders and this hour really hit on that spirit of Supernatural. Looking forward to more of it throughout the season! Permalink: Is everything a Bob Seger song to you? We’re gonna have to figure this thing out like we always do. But until then, we hunt. Permalink: We’re gonna have to figure this thing out like we always do. But until then, we hunt. 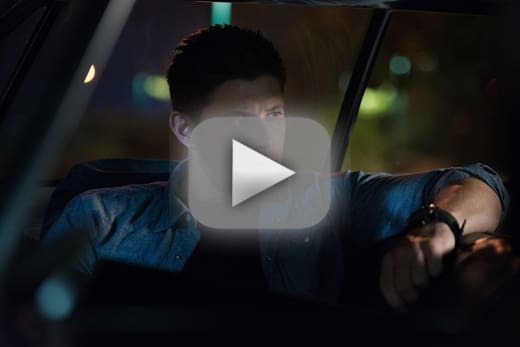 Supernatural Photo Preview: What's in the Box!? !